Despite his fragile health, Henry Clay returned to the nation’s capital in late 1851 to serve a final term as senator. Over the next few months his condition rapidly deteriorated. Finally, consumed by tuberculosis, the seventy-five-year old statesman took his last breath on June 29, 1852. 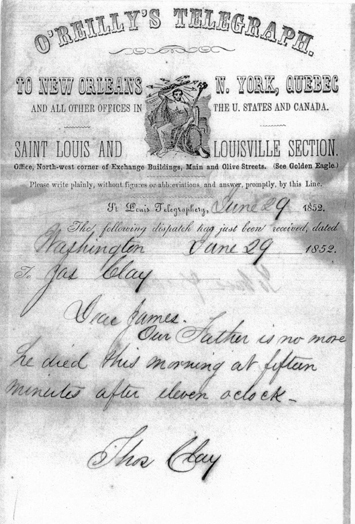 Thomas H. Clay sent this telegraph home to Lexington informing the family of his father’s passing. Befitting Clay’s status as one of the most respected and influential political figures of his time, his body was placed in state in the Capitol rotunda making him the first person in American history accorded this honor. Impressive ceremonies were held in Washington, New York, and other cities as Clay’s body traveled for the last time back to Ashland. Each stop along the return route included great displays of funeral pageantry. Upon arriving home, Clay’s body remained overnight at Ashland while his widow Lucretia kept watch. The next morning, after a memorial service on the front lawn, the funeral cortege left Ashland and proceeded across town to the Lexington Cemetery. Storefronts along the way were elaborately draped in black. As a sign of respect on this solemn day, all businesses in Lexington closed, all traffic was halted, and silence was ordered as the procession passed. An estimated crowd of 100,000 gathered in Lexington (population in 1852 was approximately 9,000) to pay their last respects. The day after Clay’s death a local committee was formed to oversee the construction of “a national monument of colossal proportions” in the Lexington Cemetery. Today, a life-size figure of Clay stands atop the monument, looking eastward across the city of Lexington toward his beloved Ashland. 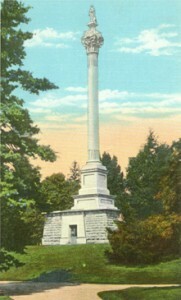 This postcard shows the Henry Clay Monument at Lexington Cemetery. One of Lexington’s most recognized landmarks is the towering figure of Henry Clay standing high above the Lexington Cemetery looking over the city toward Ashland. Clay died on June 29, 1852 in Washington, DC at the age of seventy-five. His funeral cortege traveled through much of the Northeast by train and boat, stopping at several major cities for observance, before returning ten days later to Ashland. Clay’s monument is the result of the harmonious effort of his friends to pay homage to the Great Compromiser. The day after his death, a group met in Fayette County and resolved to build a national monument honoring Clay’s life and work. A 41 member committee was formed to raise money to see the project through completion. By 1857 enough money had been pledged to begin advertising for designs for the monument. Of the more than one hundred plans submitted, a design by Julius W. Adams of Lexington was accepted. The proposed cost of the monument was $43,920. Major Thomas Lewinski, who designed the gardener’s cottage for Henry Clay at Ashland in 1846 and re-designed the plans for the mansion for his son James B. Clay in 1856, was employed as superintendent of construction. The cornerstone for the monument was laid on July 4, 1857. It was hoped that the project would be completed in 1858, but construction problems and difficulties in collecting funds delayed completion until July 4, 1861. The final cost was closer to $58,000. Clay’s body was not placed in the vault of the monument until after the death of his wife, Lucretia Hart Clay in April 1864, twelve years after his death. The limestone mausoleum and stone statue of Clay have been plagued with problems from decades of exposure. The statue was replaced in 1908 due to damage from thunderstorms, and then two years later, it suffered damage from lightning and needed extensive repairs. Environmental conditions continued to deteriorate the structure: pieces of stone began falling off the monument, a leaky roof persisted, the surface became discolored and much of the mortar between the blocks had begun to dissolve. Visitors were advised not to approach it. Nothing was done to fix these problems until ownership of the monument fell into the hands of the Fayette County Government in the early 1970s. A complete restoration began in December 1975 to preserve the monument and was finished less than a year later. Repairs were done to make the structure more sound and to better withstand exposure to outdoor conditions. Now, less than twenty-five years later, the monument is again showing signs of wear and discoloration. Recently, the monument was given to the Lexington Cemetery in the hope that they could better maintain it. A general cleaning of the monument and repairs to the iron gates were made in 1998. This will help restore the monument to a condition worthy of the Honorable Henry Clay and will help ensure that the monument will be around for future generations to look upward to. Information taken from A History of the Lexington Cemetery by Burton Milward, 1989.